Sports Surface Testing: An Introduction to Friction and Traction | ASET Services, Inc. If you’ve ever seen a sport surface specification, chances are that you’ve seen a line item in that specification for ‘Friction’, or ‘Surface Effect,’ or ‘Slip Resistance.’ It gets presented so cleanly and simply that it seems like that one number presents everything you need to know about the friction of that surface. The truth is friction is a complex property and no one number will tell you everything about a surface. It’s for this reason that this topic gets an introductory article. Subsequent articles will discuss tests for turf and tests for court and track surfaces. The goal of this article is to serve as a starting point for anyone wanting to better understand the friction and traction properties of a sport surface. It, and later articles, will also help architects and owners better understand what the friction information in product specifications. Traction – Traction forces are generated between the sport surface and the athlete’s footwear. Traction may be effected by changing the material and geometry of the shoe sole. Traction forces can be linear or rotational, static or dynamic. There are relatively few ‘traction’ tests, as these require that the loads, velocities and accelerations be similar to those produced by athletes. Traction testing may involve actual shoe soles or it may involve a standardized sole used to evaluate the property of the sport surface. Friction – Friction forces are identical to traction forces in that they can be linear or rotational, static or dynamic. Friction levels are tested using loads, velocities and accelerations that are much smaller than those produced by athletes, and rarely use actual shoes. These tests are generally performed at low load levels and provide an evaluation of the surface only. In fact many friction tests only provide insight into how the top 0.05″, or less, performs. The lower loads make testing easier and it is generally assumed that the ‘friction’ levels measured during these tests generally represent the actual traction levels that an athlete would experience. The loads are rarely large enough to evaluate the contribution of underlying layers in the system. Mixed Tests – There are a handful of tests that are somewhere between friction tests and traction tests. Here are just a few facts about friction tests, traction tests and actual traction forces. Friction won’t necessarily be correlated to the traction property of the sport surface, but in general it is usually assumed that friction tests are at least an indicator of traction forces. Simple theory is that there is a linear relationship between the normal force applied and the friction between two surfaces. The truth is that friction response is rarely linear. That means that friction coefficients will change between two surfaces as the applied load is increased. Friction results normally don’t always correlate well with another friction test. As such car should be taken when trying to convert the friction level presented from one test into the friction level that will be measured in another test. The two most common standards used in North America to evaluate indoor court friction are totally different. ASTM E303 uses a rubber sole surface and a dynamic event, while ASTM D2047 uses a leather sole and a static event. While no study exists to confirm this, it is doubtful that there is much correlation between the two tests. The friction level for one type of motion (ex: linear-static) is not necessarily a strong predictor of the friction level for other types of motion (ex linear-dynamic, rotational-static, rotational-dynamic). One surface can produce higher linear-static values than another while the other can produce higher linear-dynamic values. The following standards that are commonly used to evaluate sport and play surfaces in North America. Later articles will explore key standards in more detail. The following friction tests all utilize the same equipment and methods, known as the British Pendulum Test. The results from any of the Pendulum Test methods may be interchanged as long as the utilize the same rubber compound for the slider used during testing. ASTM E303 / EN 13036-4: This method is identical and it’s used to evaluate indoor sport surface performance in ASTM F2772 and EN 14904, and is commonly called the British Pendulum Skid Test. This test is a dynamic test and it involves a striking motion to determine the friction present in a ‘skidding’ event. PROS: This test is widely used (ASTM, EN, IAAF). It uses a rubber reference surface to evaluate the sport/play surface. This test is portable and it allows forensic in-situ testing to verify that the surface performs as specified, and to determine if maintenance programs are compromising the friction of the surface. CONS: This test applies a relatively low load (2-5 lbs), and as such it only tests the very top of a system. This standard is also referenced by the IAAF, and FIBA. 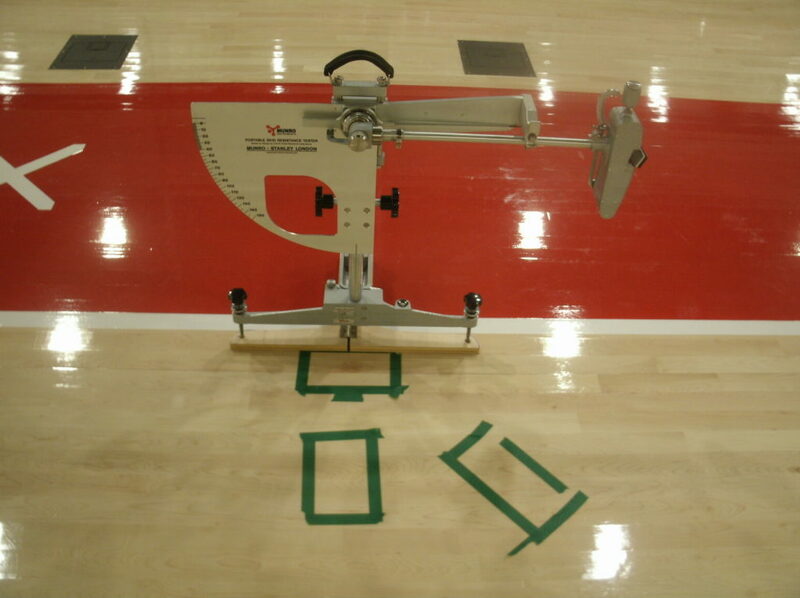 ASTM F2772: Standard Specification for Athletic Performance Properties of Indoor Sports Floor Systems references ASTM E303: Standard Test Method for Measuring Surface Frictional Properties Using the British Pendulum Tester. Specifications may present friction and reference either of these standards. ASTM E303 tells how to conduct the tests, while ASTM F2772 establishes an acceptable range for friction measured using E303. EN 14904: Surfaces for sports areas – indoor surfaces for multi-sports use – Specification references EN 13036-4: Road and airfield surface characteristics – Test Methods – Part 4: Method for measurement of slip/skid resistance of a surface – The Pendulum Test. Specifications may present friction and reference either of these standards. EN 13036-4 tells how to conduct the tests, while EN 14904 establishes an acceptable range for friction measured using E303. ASTM F2157: Standard Specification for Synthetic Surfaced Running Tracks also references ASTM E303. Specifications may present friction and reference either of these standards. ASTM E303 tells how to conduct the tests, while ASTM F2157 establishes an acceptable range for friction measured using E303. ASTM F1551 – 09: Standard Test Methods for Comprehensive Characterization of Synthetic Turf Playing Field Surfaces and Materials Section 41 is titled ‘Test Method AT-30 – Sports Shoe Traction (Coefficient of Friction) and Traction Differential.’ It is my opinion that the name of this test is misleading and that it falls with the definition of a ‘friction’ test rather than true ‘traction test. This test method does use an actual show sole for testing, but a normal force of only 25 lbs is applied to the show, well below the forces generated by athletes. PROS: This test is highly portable, and can be used to evaluate in-situ performance. CONS: The low loading levels mean that results may not be strong indicators of actual traction forces during use. EN 14387 – Surfaces for Sports Areas. Determination of Slip Resistance: This method is also known as the LeRoux friction or pendulum test. This test can be performed on turf with a studded sole, or on courts using a smooth sole. PROS: I have found none at this time. CONS: Originally included by the International Field Hockey Federation it has been removed from their performance requirements. DIN 18032-2 – Halls for Gymnastics, games and multi-purpose use. Part 2 Sports floors, requirements, testing. This test applies a normal load of 20 kg (45 lbs) to the surface. It uses 3 leather strips to simulate the shoes of an athlete. Because of how it is configured it is a combination of linear and rotational friction. PROS: This standard was widely used in Europe and North America. It is still common on synthetic sports surface specifications today. It is still recognized by FIBA. CONS: DIN 18032-2 is a dead standard. It was replaced by EN 14904 in 2006. It, like ASTM D2047, use leather to simulate the soles of modern sports surfaces. While the applied load of 20 kg is larger than some, it is still well below those that an athlete will apply. The use of leather combined with the relatively low loading means that it is not an accurate predictor of the forces an athlete in modern shoes will experience on the sport surface. The following friction standard is often applied to indoor sport surfaces but it was developed for pedestrian walkways (halls and sidewalks). ASTM D2047: Standard Test Method for Static Coefficient of Friction of Polish-Coated Flooring Surfaces as Measured by the James Machine: This is a favorite of the sport surface market, and it measures the static friction of a surface. PROS: It’s widely used in the sports surface industry. CONS: It simulates sport shoes by using a leather test surface. Why the industry continues to reference a friction standard that uses a leather sole to simulate the response of a synthetic soled sport shoe is unknown. It was designed to test polished walkways not sports surfaces. It can not be used for field testing; instead a sample must be removed and taken to the lab. At this time, I only know of one traction test and that is an ASTM Standard. It has been most often used in performance studies, and to my knowledge is not used in specifications. ASTM F2333: Standard Test Method for Traction Characteristics of the Athletic-Shoe-Sports Surface Interface. This is an actual traction test within ASTM. PROS: This standard uses loads and velocities that closely mimic those generated by athletes. CONS: This standard has never been incorporated into an ASTM Specification or used by any sport surface company. The equipment is large and while technically portable is difficult to move from site to site. There is one friction standard that fits the definition of a mixed test. FIFA – 2015 Determination of Rotational Resistance (FIFA Test Method 06). This test uses a disc with football studs attached to measure how much the surface resists rotational movement of the athlete’s foot. It applies a significant normal force of 46 kg (100 lbs). This load is less than the maximum load that could occur during athletic movements but it is much closer to actual loads that any of the other friction tests in this article. PROS: This test uses a loading level that is significant and approaches those of an athlete. This test is portable and allows in-situ testing. CONS: This test is currently specified and adopted by FIFA. . This is an introductory article, and this is probably enough information for now. ASET will be developing another article in the future that will explore the requirements of the various standards that were introduced here. If you have any sport surface testing questions, please feel free to contact ASET Services, Inc.